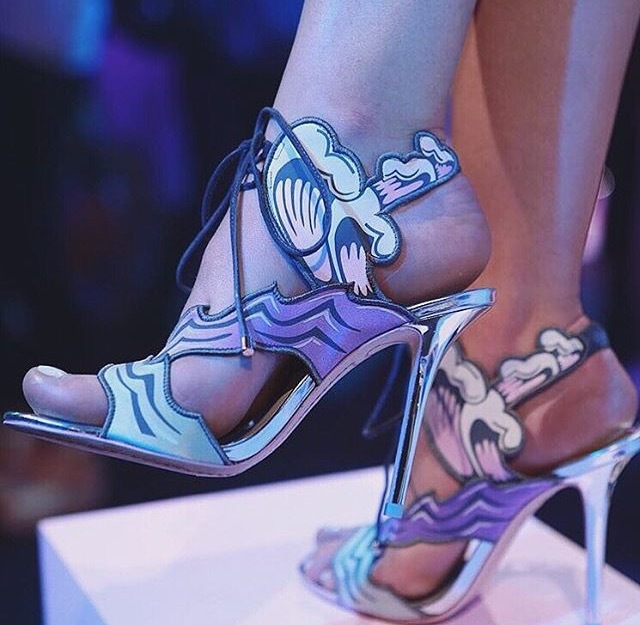 For Spring/ Summer ‘16, Sophia Webster’s imagination goes underwater. We are invited to join her to view her collection at the world’s most style-conscious Mermaid Laundrette. “CrazySexyNautiCool” immerses us in a world of oceanic prints, beach sunsets and dreamy iridescence. For years I have been dreaming about presenting a collection in a fantasy Mermaid Laundrette where mermaids spend a few precious hours on land to wash their tails and wear their favourite shoes. Following the journey from land to water, Sophia Webster’s sirens are influenced by hanging out poolside with David Hockney and watching the sunset. A Yoko Honda inspired colour palette gives a nod to bicoastal beach meccas Miami and Malibu in their heyday. Elements including nautical rope, Hokusai-esque wave artwork and beach ball beads adorn signature heel shapes and flat sandals. Once underwater, signature silhouettes are decorated in vibrant energetic prints on loan from tropical fish. Rich ocean life is referenced in an abundance of neon-hued coral made from laser cut leather, while chunky platform heels stand out with intricate stone beading to give the effect of the ocean bed. Iridescent lamé and soft pastel-coloured gems hint at dreamy mermaid influences including Daryl Hannah in the 80’s classic, Splash, while tie-dye thigh-high netted boots with intricate beading evoke Californian beach-babe styling. The Lilico Underwater Sandal featuring neon-hued coral made from laser cut leather.